One of my favorite games of last year has made it to the Nintendo Switch, and I’m tearing through it once again. I’m talking about Thumper, the tremendously intense and stressful sensory assault created by Marc Flury and Brian Gibson (yes, of the amazing noise rock band Lightning Bolt). Calling it a “rhythm game” instantly draws parallels to the likes of Guitar Hero or PaRappa The Rapper or even Amplitude. There’s the understanding that you’re playing along with the music, acting it out as it proceeds with or without you. Thumper is so fascinating because it’s essentially an anti-rhythm game. The music, all pounding percussion and skittering keys, is the enemy. The music wants you dead. It manifests itself as giant, spiny skulls and liquid-metal centipedes that barf obstacles at you with every synth stab and hand clap. And you, a noble chrome space beetle, have to literally fight back against it by responding to its rhythms and harnessing the music’s own power against it. The whole game is a spin on that call-and-response concept, with the soundtrack laying down the challenge for you to mimic. But it all happens so quickly and within a vast sonic gestalt that it’s not quite as easy as it sounds. Making matters even worse is the music’s astronomical complexity, when compared to your usual pop-based rhythm game fare. It veers into odd time signatures and makes you tap along almost exclusively in jerky syncopation. For people who aren’t quite so musically inclined, I have to imagine it’s difficult to even recognize and internalize the game’s patterns. 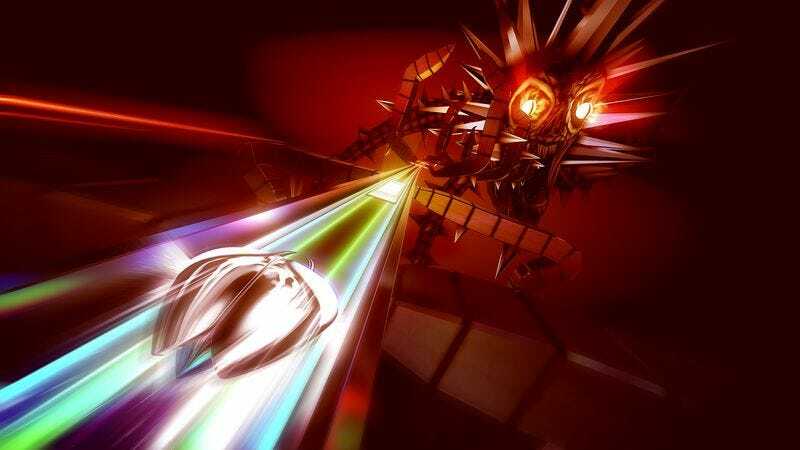 Thumper on Switch has all the brilliant frustration and fury of its PC and PlayStation 4 counterpart. It looks absolutely stunning on the Switch’s built-in screen, and if, like me, you don’t have a VR headset to play on, getting its breakneck action right up in your face is an especially intense way to play. (Just be sure to go into the menu and crank the volume, because the default setting is not nearly loud enough.) The big addition this version sports is support for the Switch’s “HD Rumble,” bringing an actual physicality to the violence on display and turning your hands into another point of sensation for the game to devastate. It’s not the kind of thing you’re likely to notice when the game is frying every nerve in your body, but the new dimension is a novel, fitting add-on that the developers implemented in some subtle ways. If you’ve yet to play it, and you’re up for something that will leave you shaking, sweating, and swearing, now’s a good time to answer Thumper’s call. I’m enjoying the hell out of Prey, and a lot of it comes down to how liberatingly difficult a beast it is and that gives me the freedom to do anything to stay alive. As Matt noted in the first part of his Game In Progress review, the first half of the game is almost ridiculously hostile to the player; even once you’re somewhat well-equipped, all it takes is a single bad encounter to tear your health to shreds. There’s something immensely refreshing about having a game of this ilk, where stealth is a practical, not a moral, concern; where there’s no hidden counter ticking away every time I take the lethal option against my foes. Playing Deus Ex or Arkane’s own Dishonored games, the ethical player has to hold back from unleashing their full arsenal, lest some poor dumb human get caught in the crossfire. But the monsters on Talos are too dangerous for any kind of restraint or fair play, and I’m reveling in luring them into hazards, sneak attacking them with a shotgun blast to the back of the head, and (on one memorable occasion) sending a Phantom rag-dolling by hurling a 500-pound cargo pallet at its skull. Every fight in Prey is a puzzle and working out those solutions in the face of absolute death is a thrill I don’t usually allow myself to indulge in. Do I spend some of my precious Q-Beam ammo to explode my foes? Lure them into the range of an explosive canister? Or just transform the lot of them into handy little cubes of building materials with the glorious grenade-y majesty of the Recycler Charge? It’s a giddy thrill every time I get to pick. I recently got a hot deal on almost every Resident Evil game available for Xbox One, so I’ve been going back and playing through them in chronological order. The first game totally holds up, especially as a weirdo spin on the classic Metroid structure, but I’m already starting to regret my mission just a few hours into Resident Evil Zero. It’s one of those prequels that mostly exists to remind you of things you enjoyed in the first game, but it shakes up the Resident Evil formula by letting you control two characters at once. This is a great idea in theory, since it adds a new dimension to puzzles and lets you battle zombies from two fronts, but the developers totally dropped the ball by making one of the characters a man who is good at everything and the other character a woman who is bad at everything. That means you constantly have to protect the weaker character, except when the game throws you into situations where she’s simply too fragile to operate a lever and you have no choice but to leave the strong guy behind and step into some obvious trap with her alone. I’ll still finish it, but only because I know things get even worse later on in the series.